The water strikes fear in people, both young and old. That’s one reason there are swimming related requirements for both Second Class and First Class Scout. If you don’t ever go near the water, you just can’t make rank past Tenderfoot. Some people are scared they’ll drown and some just don’t have the ability to swim. That’s where Boy Scouts can help out. We’re working out the details for some swimming instruction for all of our scouts that haven’t completed their swimming requirements, yet. So, if you’re interested, please let your scoutmaster know at your next meeting. And for those that swim well who are at least 16 years of age (youth and adults), if you’re interested in the possibility of becoming a life guard, let me know, too. It’s possible we can arrange that training, too. Stop, turn sharply, resume swimming, then return to your starting place. Explain why and how a rescue swimmer should avoid contact with the victim. 9.b: Successfully complete the BSA swimmer test. Then swim 25 yards using an easy, resting backstroke. The 100 yards must be swum continuously and include at least one sharp turn. 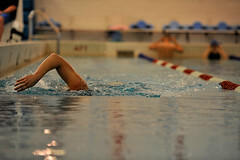 This entry was posted in News and Events, Training and tagged swimming. Bookmark the permalink.